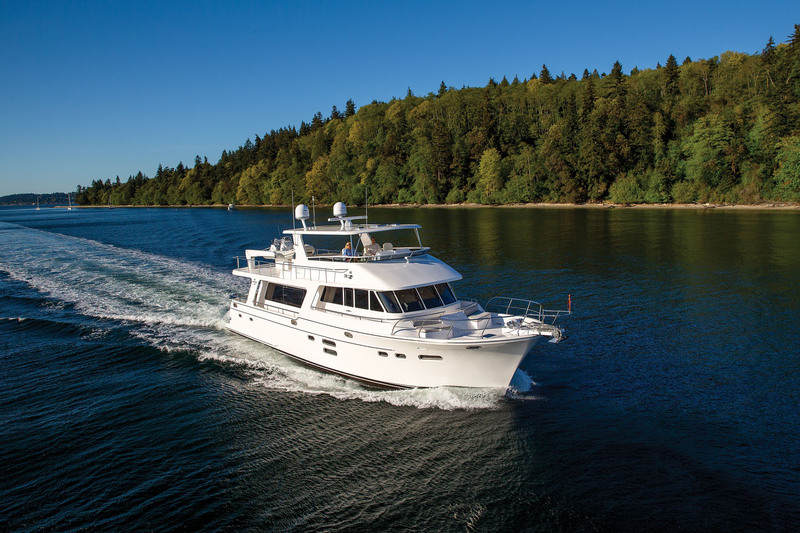 Hampton’s new Endurance series of long-range cruisers may well persuade many people that the cruising lifestyle can be as comfortable, luxurious and even more exciting than staying ashore. In developing the Endurance series, Hampton set out to produce one of the most stable hulls available to recreational boaters — a good feature for a series of long-range cruisers. Good stability means safety and comfort on the open ocean. 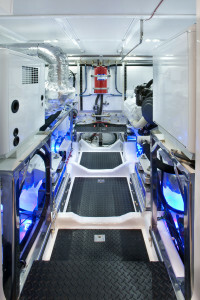 According to the builder and the designer, the final stability calculations exceed the U.S. Coast Guard stability requirements for Commercial Open Ocean Service and also the IMO (Intergovernmental Marine Organization) international standards. Hampton wanted the Endurance hulls to be fuel efficient, particularly at cruising speeds in the 8-knot range. To help meet the varied goals, the builder retained Howard Apollonio, a respected Pacific Northwest naval architect and marine engineer. The result is what Hampton calls a “hybrid hull,” which features a fine entry and a round bottom hull in its forward one-third, with the traditional spray rail molded in well above the waterline along that same forward one-third. The aft two-thirds of the hull is a hard chine and is a semi-planing form with a wide, shallow stern that allows water to flow easily out from under the hull to create very little wake (and drag) at lower speeds. Prop tunnels have been integrated into the hull to help improve the hydrodynamics. 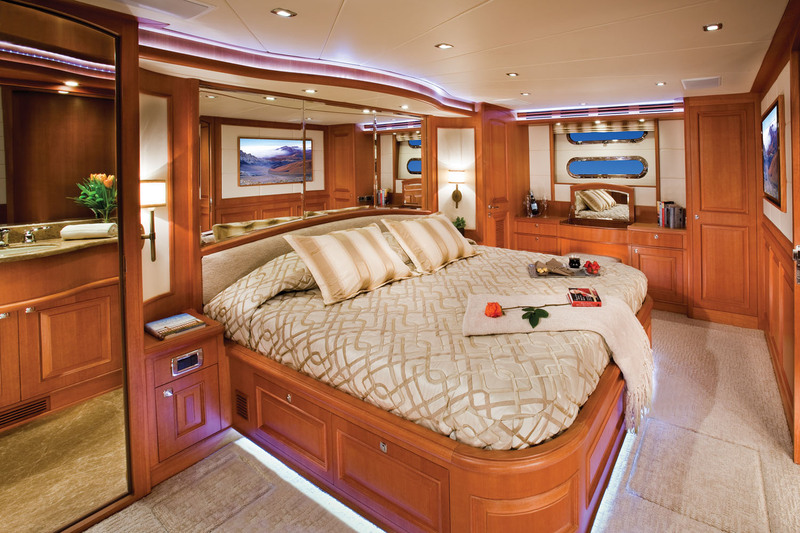 The entire Endurance hull is solid hand-laid fiberglass. Laminated into the hull, from chine to chine, are two layers of Kevlar, which provides additional strength and stiffness, without adding much weight, in case the vessel strikes floating debris. There are three layers of Kevlar in the hull’s forward collision zone. Vinylester resin is used for the first five layers of hull layup, which is helpful in preventing the hull laminate from taking up water as the vessel ages. The deck and topsides are cored glass. 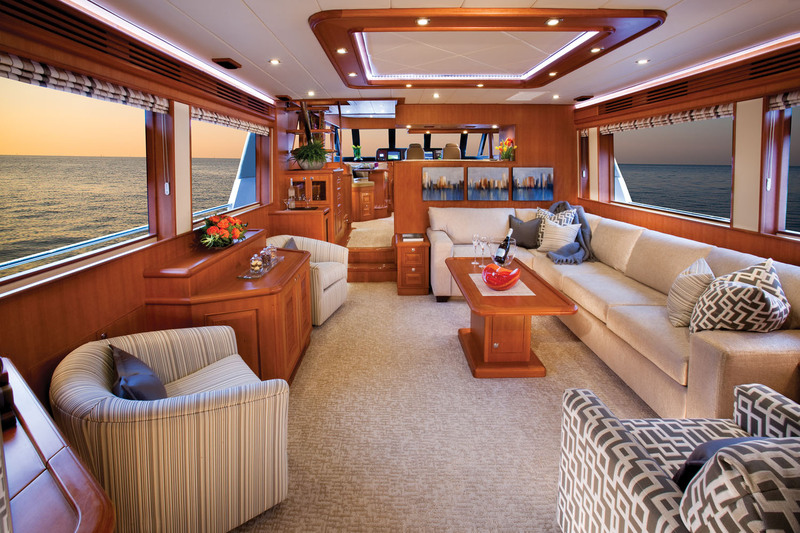 There are four different ways to board the 68-footer: through coaming doors to port and starboard, directly from the dock, or onto the built-in swim step and up through port or starboard transom doors. Getting aboard by any of the means proved to be quick, safe and easy, especially since the swim step is secured by waist-high staple-style safety rails. 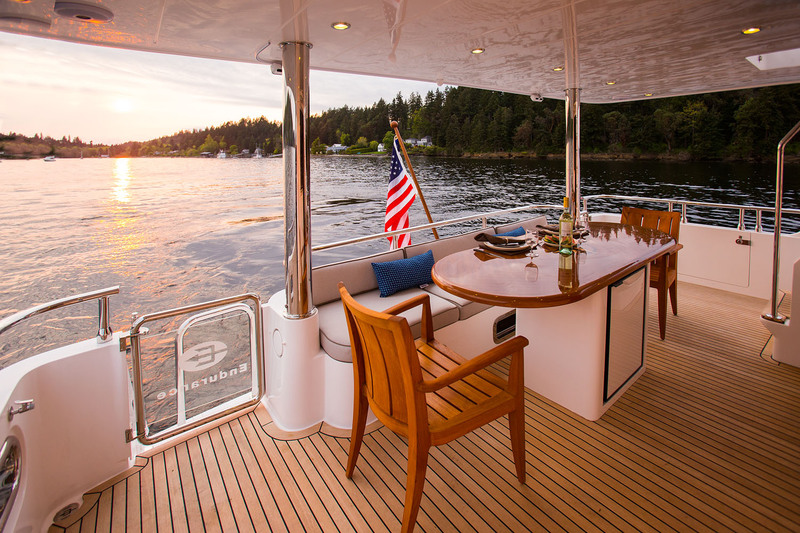 The fully covered aft deck features a beautifully finished table and a comfortable, cushioned bench seat. There is also a drop-down 26-inch flat-screen TV, a refrigerator, an overhead and blue LED courtesy lighting. Activities on the aft deck can be monitored by a remote camera system that streams to a multifunction display at the helm station. Port and starboard docking stations with engine and thruster controls allow control from the aft deck. The main deck day head, complete with a vanity and a good amount of storage, is entered off the aft deck. The foredeck and Portuguese bridge are reached along covered port and starboard walkways with nonskid teak decking underfoot. The foredeck itself has a molded-in nonskid surface sharp enough to provide good footing even when wet. The welded stainless oval-shaped handrails provide good security for anyone working forward. The flybridge is reached via a set of steps off the aft deck. 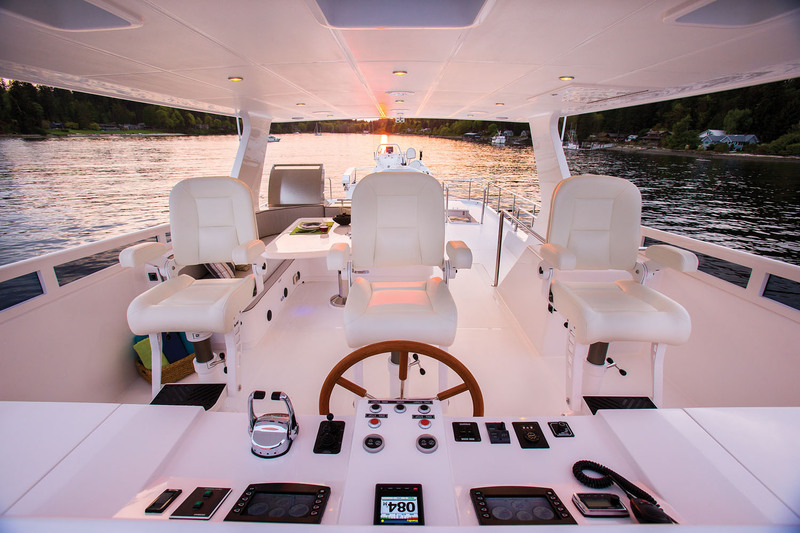 The centerline helm station is complete with engine and navigation instrumentation and three individual helm seats. A food and beverage service center featuring a refrigerator/ice-maker, hot and cold water, a stainless sink and a large propane barbecue allows for comfortable full meal prep. An L-shaped cruising settee with an adjustable table provides comfortable seating for passengers who want to dine alfresco. 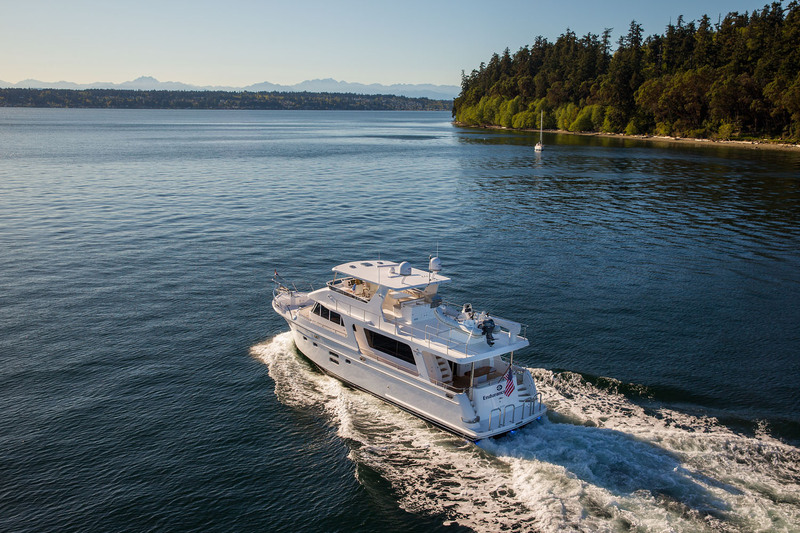 The flybridge is protected against the Pacific Northwest rain or the scorching tropical sun by a solid hardtop that covers all of the furnishing and equipment. 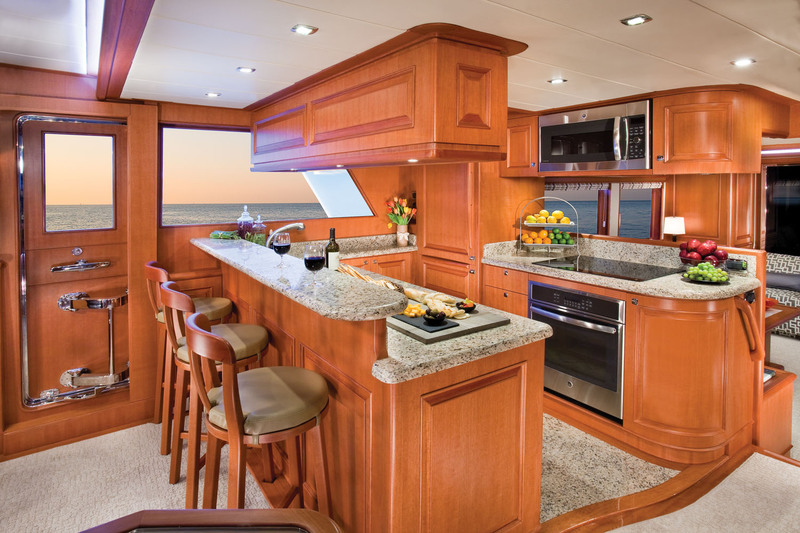 That hardtop features three opening skylights, with screens, in case an owner wishes to enclose the flybridge. An optional 26-inch flat-screen TV flips down from the overhead. A stairway to port leads down to the pilothouse. The custom-designed interior soft materials nicely complement the satin-finished raised-panel cherry cabinets. Three barrel chairs, a cherry adjustable-height cocktail table, cherry end tables and a 46-inch LED TV give the interior the look and feel of the first-class private club. The fit and finish of all the woodwork is first class, and the custom ceiling, with indirect LED lighting and a Bose Lifestyle surround system, adds to the overall feeling of comfort and luxury. The U-shaped galley is to starboard, just aft of the helm station, enabling the cook and the skipper to chat with each other. An elegant granite countertop provides plenty of easily cleaned space for food prep, and the optional heated granite floors are a nice touch, particularly in cooler weather. A large stainless sink, a Sub Zero refrigerator with freezer drawers and an ice-maker, a dishwasher, a four-burner cooktop and oven, a convection microwave oven, a trash compactor and an in-sink garbage disposal round out the galley. There is plenty of cabinet and drawer storage. 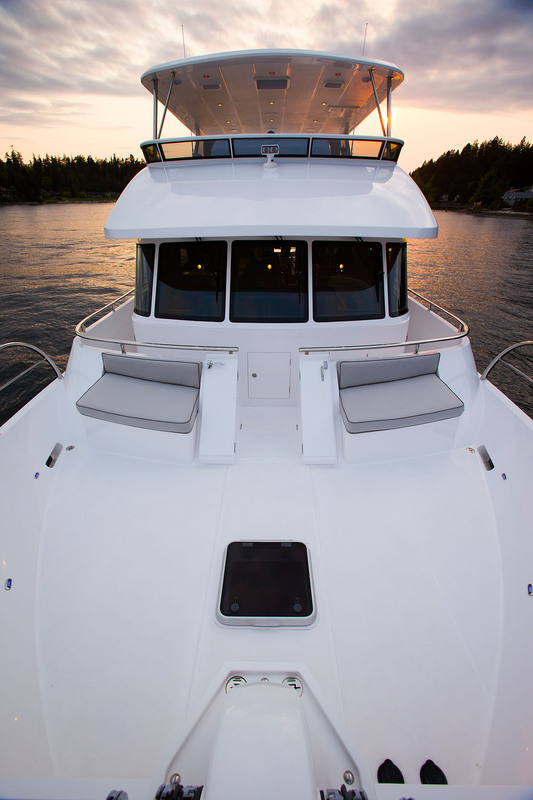 The pilothouse features a centerline helm station, something very important to many operators of boats of this size, delivering a “balanced view” as the vessel maneuvers through crowded marinas. A second helm chair is to starboard. 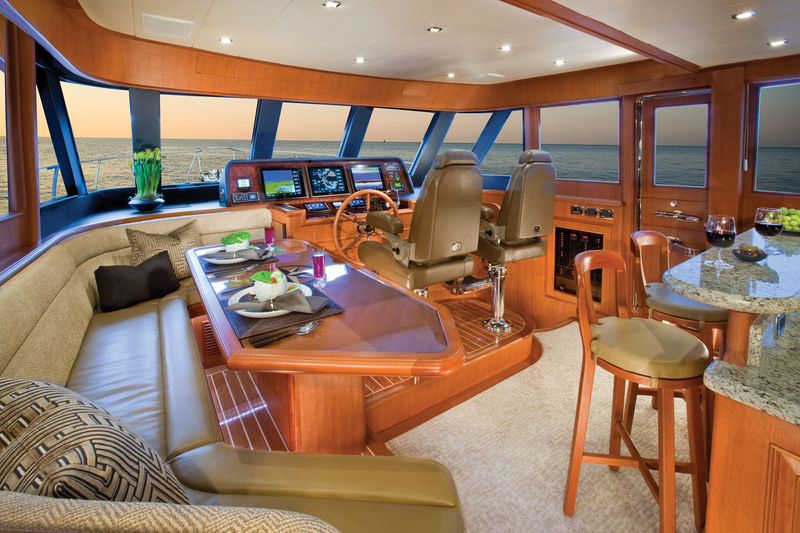 A comfortable U-shaped dinette is positioned to the port side of the helm station. Aircraft-type doors, port and starboard, complete with pantograph hinges, allow for easy access to the sidedecks. The three main staterooms on the vessel are down and forward of the pilothouse. All of them are as well finished as the rest of the vessel. 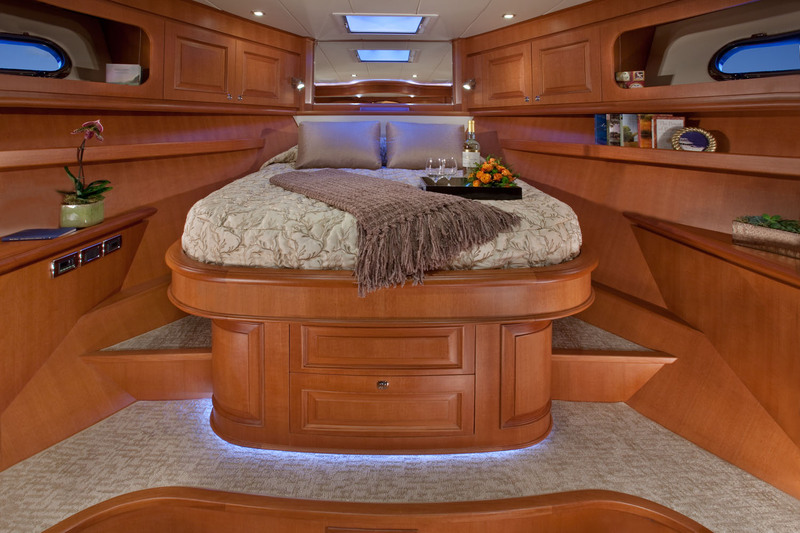 The full-beam master features an island king bed, a walk-in cedar-lined closet, port and starboard portlights, an LED TV with surround sound and a custom headliner with indirect LED lighting. The master head sports a marble countertop and a heated marble floor, a separate shower stall, a vanity with plenty of storage, a full-width vanity mirror and a medicine cabinet. 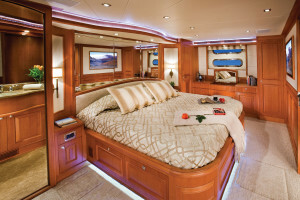 The VIP stateroom, in the bow, is finished to the same quality as the master but has a queen bed and private access to the forward head, which it shares with the third stateroom, which is to port and is fitted with side-by-side twin beds. 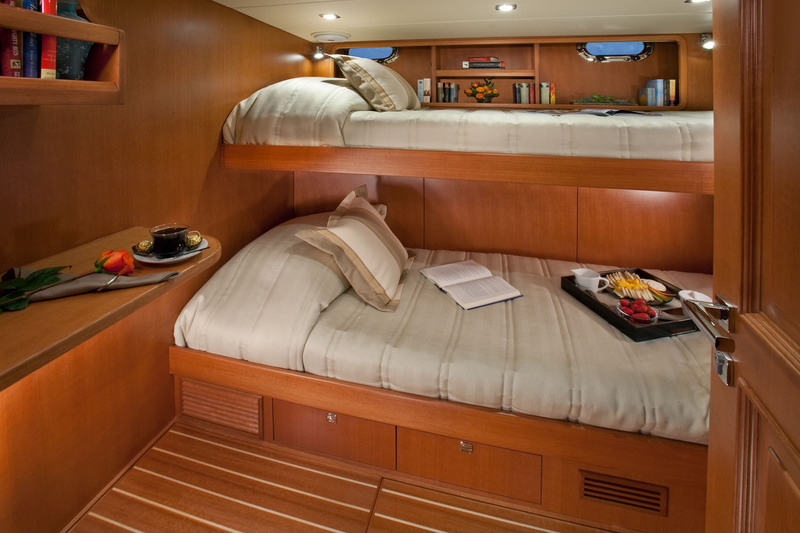 There is a fourth stateroom on the 658 that is billed as a crew quarters. We fired up the twin 750 hp John Deere diesels, and they started quickly, without clatter, rattle or smoke. The 13.5L six-cylinder engines weigh in at 3,362 pounds and are powerful engines for their weight and displacement. They are turbocharged, aftercooled, and computer controlled. 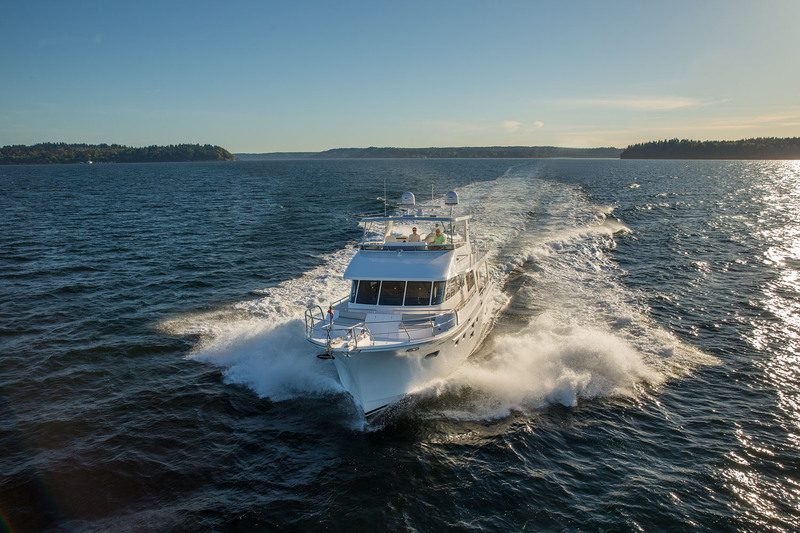 With Hampton Seattle’s Scott Hauck at the helm, we idled easily out of a very tight berth and into open water. We made 5.3 knots and burned 1 gph per engine at idle. When we upped the rpm to 1000, we made 9 knots and burned 8 gph total. At speed/length ratio 1 — 7.8 knots — the engines were turning at 950 rpm and our fuel burn was 6 gph combined. At 1500 revs, our speed was 13.5 knots and the fuel burn was 29 gph per side. Top speed was 15.5 knots at 2100 revs, and the fuel burn was a combined 74 gph. All speeds were confirmed by an independent GPS, and fuel consumption data came from the engines’ onboard computers. Twin 13.5L John Deere 750 hp diesels, ZF transmissions, Kevlar in hull, twin captain’s chairs on flybridge, cherry interior (high gloss or satin), LED lighting, stabilizer fins, TV and surround sound in master stateroom, 20-gal. water heater and more. 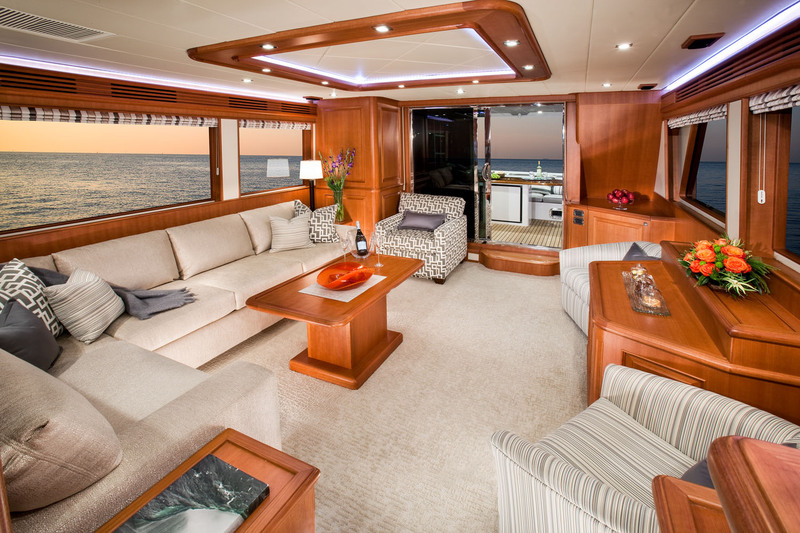 Twin CAT C-18 Acert 873 hp diesels, flybridge A/C, second PH helm chair, leather steering wheel, electric high-low table in salon, heated galley sole, underwater lights and more. www.hamptonyachtgroup.comHampton Yacht Group, Newport Beach, Calif. This entry was posted in Boat Tests, New Boats by Roger McAfee. Bookmark the permalink.